It is a quarterly journal focusing on the application of various concepts of communication and behavioral aspects of personal effectiveness including Organizational Communication (Corporate Communication), Interpersonal Communication and Global Communication. It would also address issues on Stress and Attitudes and aims to be a medium of expression and exchange of ideas among soft skills trainers that would be of interest to academicians and industry professionals. Privileged access to Online edition for Subscribers. In the study of career success in a rapidly changing world, the importance of preparing established career professionals for increased success as they transition from roles and/or organizations has increased. Measuring success in careers has also changed. In this field of study, intrinsic variables are now perceived as important as the extrinsic as we move forward and consider the whole personal and life-span development in addition to the extrinsic, objective measurements predominant in the past. The paper is a study of the efficacy of an online graduate program designed to prepare students with the mindfulness, dialogue, collaboration, and communication skills necessary for the 21st century global workplace. © 2018 IUP. All Rights Reserved. Entrepreneurs play an important role in the economic development of emerging economies such as India, and Entrepreneurship Development Programs (EDP) at various life stages boost it. EDP's impact at the +2 level is strategic and timely as it adds self-sufficiency to the young who are either forced to or willingly take up entrepreneurship after their +2 education. Creating a new venture and the sea of uncertainties and risks involved in entrepreneurship can be daunting and frustrating, testing the tenacity of the +2 students' soft skills, especially soft communication skills. Soft communication skill helps in information gathering, customer handling, teamwork, communicating with stakeholders, establishing relationships, and in tackling the challenges involved in venture creation. 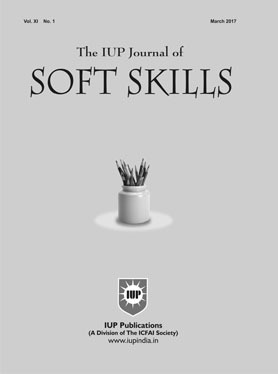 This paper thus argues for the teaching of soft communication skills in entrepreneurship development courses at the + 2 level, and highlights the need for and benefits of taking such initiatives, whilst suggesting certain broad guidelines in this regard. Hope - a word which means so much for so many. One may wonder what an abstract emotion like 'hope' has to do in the world of corporate culture and professionalism. It is a fact that the industry today dangles on methodical, goal-oriented and structured strategies for business and its profits. Most companies, however, also rely heavily on customer satisfaction as well as employee performance and satisfaction. Hope plays a pivotal role in such a context. In this era of ever-changing project scopes and high pressure deadlines, it is important for individuals and organizations to create and maintain an optimistic and positive environment to keep the day-to-day activities going on. Apart from the various extracurricular activities and periodic rewards programs, employees feel a sense of fulfillment while looking forward to what they can achieve in the future with a hope that their desires, ambitions, and goals are met. This paper discusses certain methods that both individuals and organizations can apply to keep hope alive within and also highlights certain benefits of being hopeful. Efficient stakeholder relationship management is an essential requirement for any successful organization. It is a decisive factor and has a direct impact on total environment and profit results of the organization. A methodological approach is needed for proactive stakeholder relationship management in view of the varied stakeholders who have altogether different sorts of expectations and needs. Effective communication management can serve as a strong tool to systematically manage the stakeholder relationships at multiple levels. The main objective of the study is to explore the use of effective communication in stakeholder relationship management and also to find out a methodological framework to use communication as an effective tool for managing successful stakeholder relationships at all levels. The study is conducted through a questionnaire survey and structured interviews of stakeholders working at different project organizations. The results indicate applications of communication in managing multiple functions of stakeholder management. A framework for effective communication management is suggested as a part of the results which can be used by practitioners in all types of project organizations for successful stakeholder relationship management.